A Syrian archbishop warned British politicians of the folly of supporting Islamic militants in the war in his country. 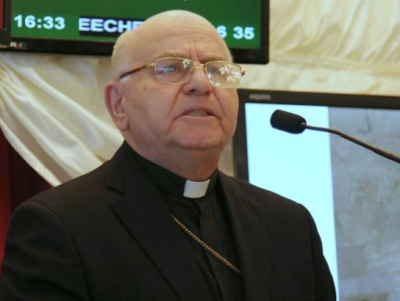 Greek Melkite Catholic Archbishop Jean-Clement Jeanbart of Aleppo said that for the past 60 years, Syria has strived to become a modern secular state. Western support for militants against Syrian President Bashar Assad would destroy all such progress, he said at Tuesday’s meeting in the House of Lords organised by Aid to the Church in Need, a Catholic charity helping persecuted Christians. Christians in his country were instead supportive of Russian military intervention because it gave them fresh hope that the four-year war would end in a solution favorable to them, he told British politicians and Christian leaders at the meeting. British Foreign Office Minister Tobias Ellwood disagreed with the archbishop’s analysis, telling the meeting that the conflict would continue until Assad stepped down. “Please, I ask you, I beseech you to have another look at our situation to see what is underneath, what is happening,” the archbishop said. “It is terrible for us to see all the marvelous things we had destroyed for pretend democracy and freedom. Our country was fighting for 50-60 years to become a secularist regime, a pluralistic country, to give citizens their rights of religion and freedom of choice … and you are destroying this work and pushing on us fundamental jihadis who want to kill everyone who is not similar to them. “The most important thing we are suffering from is that they are destroying man. They are taking away our right to choose what we want to be,” he said. The perception that moderate rebel forces were fighting the government to win freedom and democracy was a “big lie,” the archbishop told the meeting, adding that the war was waged between a modern secular state tolerant of religious minorities and jihadi groups who were massacring them. He said Islamist rebel groups, who go under a variety of names, had slaughtered more than 50 Christians within the last month alone, most recently shooting dead three Assyrian Christians after a ransom for their lives was not paid. The conflict in Syria has claimed about a quarter of a million lives and displaced some six million people, most of whom are living in camps along the country’s borders, while thousands of others have entered Europe through Turkey. In 2013, British Prime Minister David Cameron failed to persuade Parliament to support the bombing of the Syrian regime by the United Kingdom in support of moderate rebel groups. He is expected to try again for permission to intervene militarily within the next few weeks. Critics of his policy, including Peter Ford, a former British ambassador to Syria, say such moderates scarcely exist, arguing that the forces arrayed against Assad are invariably extremists. They also claim that interventions in Iraq and Libya have proved disastrous. But Ellwood told the meeting that Assad was an obstacle to peace because no “inclusive government” could ever be formed under his rule. “The recent Russia action is a clear demonstration of the Assad regime’s weakness,” he said. He said that Britain was presently “supporting nongovernmental efforts to promote dialogue between different ethnic and religious groups in Syria” in preparation for the reconstruction of the country after the fall of Assad. It was also attempting to promote interfaith dialogue in Iraq, where Christians are suffering acute persecution, he said. The meeting was also addressed by human rights activist Lord Alton of Liverpool; Timothy Cho, an exile from North Korea who has witnessed the public execution of Christians there; and Victoria Youhanna, a Nigerian woman who escaped from Boko Haram. Youhanna told participants how she had personally witnessed the beheadings of Christian men after they refused to join Boko Haram. Archbishop Silvano Tomasi, the Holy See’s permanent observer to the United Nations in Geneva, detailed the efforts of the Vatican to end the global persecution of Christians. Such violence, largely at the hands of militant Muslim groups, was “emptying the Middle East” of the Christian presence, Archbishop Tomasi said.